In the summer of 1982, hospital emergency rooms in the San Francisco Bay Area were suddenly confronted with mysteriously “frozen” patients – young men and women who, though conscious, could neither move nor speak. Doctors were baffled, until neurologist J. William Langston, recognizing the symptoms of advanced Parkinson’s disease, administered L-dopa – the only known effective treatment – and “unfroze” his patient. Dr. Langston determined that this patient and five others had all used the same tainted batch of synthetic heroin, inadvertently laced with a toxin that had destroyed an area of their brains essential to normal movement. This same area, the substantia nigra, slowly deteriorates in Parkinson’s disease. As scientists raced to capitalize on this breakthrough, Dr. Langston struggled to salvage the lives of his frozen patients, for whom L-dopa provided only short-term relief. The solution he found lay in the most daring area of research: fetal-tissue transplants. The astonishing recovery of two of his patients garnered worldwide press coverage, helped overturn federal restrictions on fetal-tissue research, and offered hope to millions suffering from Parkinson’s, Alzheimer’s, and other degenerative brain disorders. This is the story behind the headline – a spellbinding account that brings to life the intellectual excitement, ethical dilemmas, and fierce competitiveness of medical research. 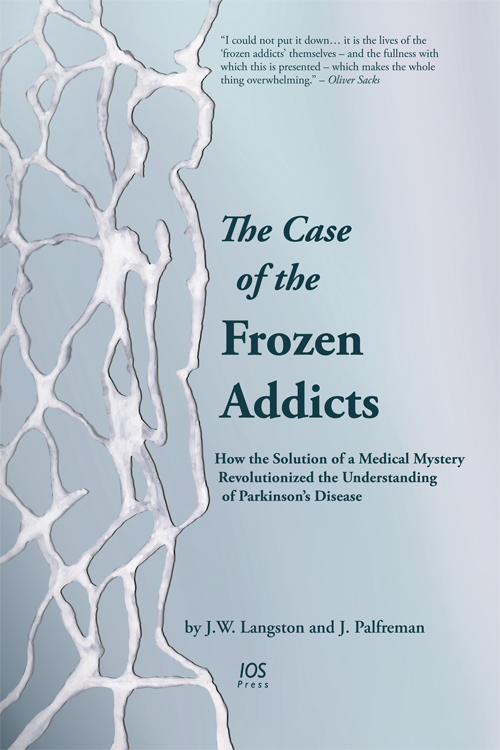 This new updated edition of the classic neurological mystery tale, “The Case of the Frozen Addicts,” illuminates how the solution to a baffling mystery of the brain’s chemistry opened a new frontier in medicine and restored life to people without hope. Jon Palfreman’s new book is called Brain Storms and will be released 15 September 2015. For USA. For The Netherlands.